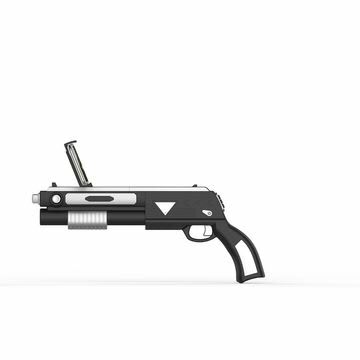 High performance: AR gaming gun has a professional trigger, precise operation and fast response in the game. Ergonomic design: AR guns are Made of safe and environmentally friendly ABS material, portable with ergonomic design, comfortable for long time playing. This AR Bluetooth shortgun for gaming realizes seamless combination between real-world and 3D virtual gaming scene and creates astonishingly strong visual impact results, which totally allows you to immerse yourself in the amazing AR gaming world. Built-in Bluetooth 4.0 that works with iOS iPhones and Android smartphones, the phone stand holder can stretch form 3.5 to 6inch. Easy to use, you can play games indoors and outdoors, just pick up the AR Bluetooth shortgun, ideal for home, office, kids, adults, etc. You can trust on our certified AR gaming guns, as you already has trusted on our quality Hoverboards, Hoverkarts, Electric Skateboard and Drones for sale UK.